Year after year, the Wolf dual fuel is our most popular range – with gas up top, electric dual convection below and 10 cooking modes, it makes fixing consistently delicious meals almost effortless. Dual-stacked gas burners now produce 33% more high-end power for up to 30% faster boil times. Available in 76 cm, 91 cm, 122 cm, or 152 cm models, with cooktop configurations that include teppanyaki, chargrill and French top options. Crisp crusted pizza or perfectly done chocolate chip cookies – this range defines delicious. If only you could get that stone oven pizzeria flavor in your own kitchen. 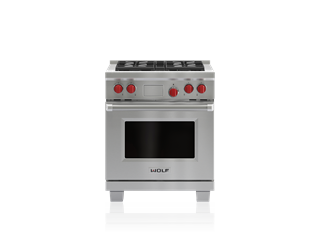 Well now you can, with the help of Chef Coleman and the bake stone accessory for the Wolf dual fuel range. Watch as he and Wolf owner Missy whip up two of the most delicious pizzas you’ve ever seen. 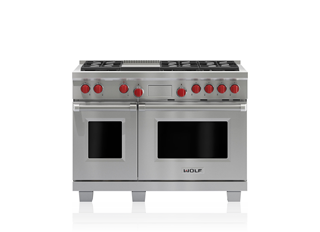 Certainly, you can fix eggs and pancakes on the teppanyaki of the Wolf dual fuel range. But how about lamb sliders and other dinner delicacies? Chef Coleman shows Wolf owners Holly and Carly how to use the teppanyaki like it’s the most useful pan ever. Three trays of perfectly browned chocolate chip cookies, baked in one easy batch. That’s just one of the culinary feats you can master with the dual convection system in Wolf dual fuel ranges, and our Chef Coleman shows you how it’s done. We believe that 190° should be 190° everywhere. 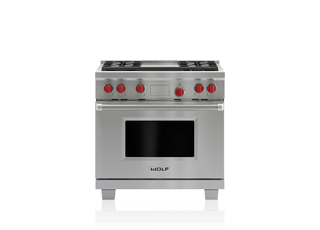 Most ovens can't deliver; they have hot and cool spots that can make cooking or baking a hit-or-miss proposition. Wolf E series ovens and dual fuel ranges are dramatically different, with their advanced dual convection system. Two fans and multiple heating elements control heat and airflow more precisely than less sophisticated single-convection systems. More uniform heat throughout the oven and across all racks, and the efficiency of circulating air around the food, produce faster, more consistent, more predictably delicious results for your baking, roasting, and grilling. 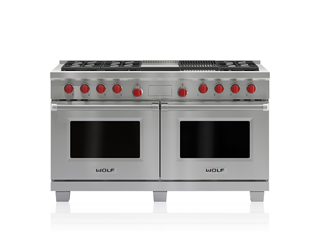 Look closely at the gas burners on a Wolf dual fuel range, rangetop or cooktop. They're called dual-stacked, sealed burners. See the two tiers of flame ports on each burner, one above the other? One delivers higher heat; the other comes on for lower heat settings. Turn it way up for high-MJ searing heat. Twist the knob the other way and you can instantly have the merest breath of flame for simmering without boiling and melting without scorching. Looking for special rangetop configuration?